Choosing the right toys for 1 year old can help develop your child’s imagination and coordination. Buying toys that are inappropriate for your child’s age can do more harm than good. Thousands of toy related injuries are reported each year and many of these injuries occur when parents give their children toys that are meant for older children. Many toy manufacturers follow safety guidelines for their products but there are still some that don’t. As a parent, it is your responsibility to find baby toys that your children will enjoy and that you know are safe. These suggestions can help you make the right choice when selecting toys for 1-year olds. 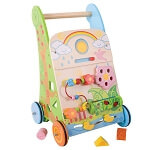 Choose toys that suit a child’s age, abilities, skills and level of interest. It can pose safety hazards if you buy toys that are too advanced. Always look for the letters “ASTM”. This indicates that the toy meets the national safety standards set by the American Society for Testing and Materials. Make sure to read any warning labels before buying baby toys. You can also check the Consumer Product Safety Commission's website to see the list of recalled toys and recall alerts. Toys for 1-year olds should be made of durable materials and have no sharp edges or points. It should also be able to withstand any impact. Instructions on how to play the toy should be read carefully. Suggested age levels and safety instructions should also be followed for developmental and safety reasons. List safety rules in playing and share them with your children. If your children are playing with their friends, remind them of your safety rules. Play teaches your child how to interact with others and develop their learning. In toy selection, your child’s current developmental stage should play a major role. Observe the current skills that your child is learning such as fine motor skills, letter recognition and language development and choose toys that develop and enhance those skills.